It’s great to have what amounts to about three small wild hogs worth of meat in my freezer at this point. That includes several shoulders, a few hind legs (hams), 3 or 4 loins and some odds and ends. 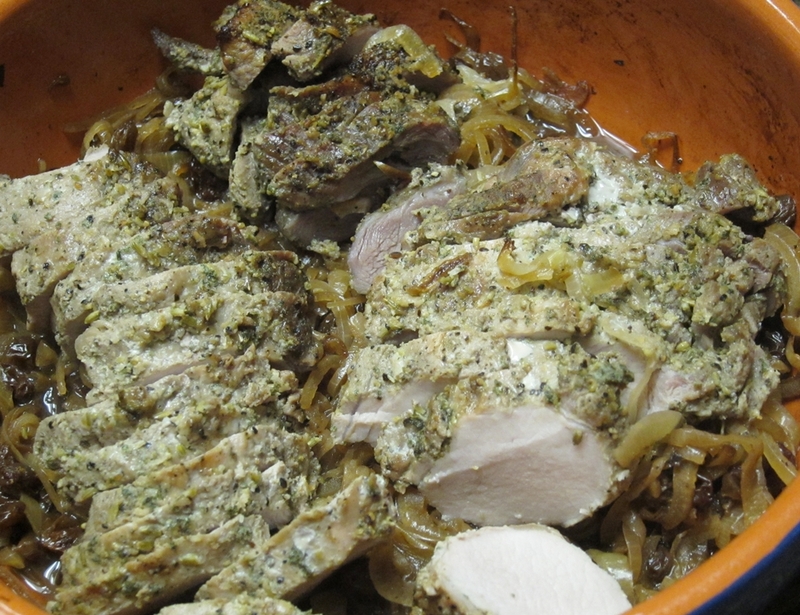 I am planning to use the meat in many recipes that call for good old pork. Wild boar is leaner and a little tougher than domesticated piggies but with some attention to cooking time and other details that should be no problem at all. Paula Wolfert has several rustic recipes in her “Meditteranean Clay Pot Cooking” for pork and wild boar. That’s where this recipe comes from. 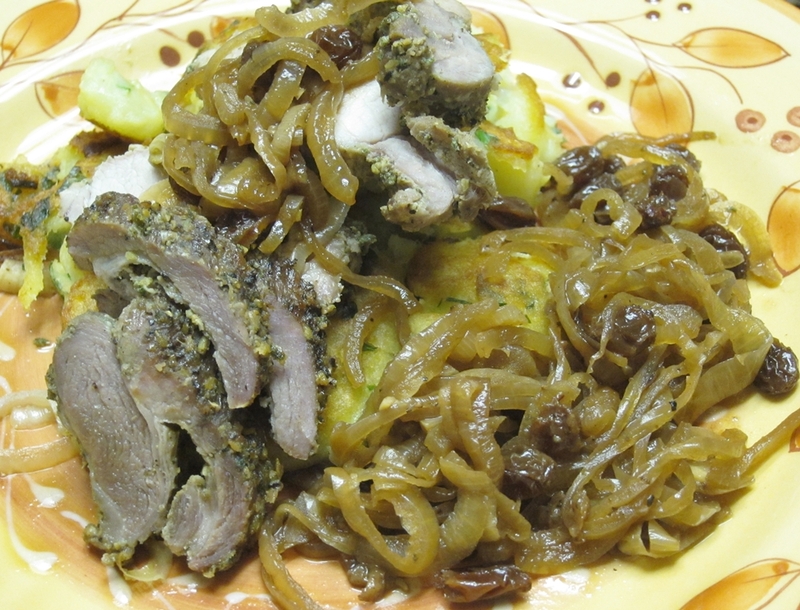 It’s a pork loin, roasted on a bed of onions and raisins in a clay pot and flavored with vin de noix (homemade fortified green walnut wine), fennel and garlic. To marinate the meat I pounded together a mixture of garlic, fennel, sage and salt. I also added some lemon juice for acidity and flavor and marinated the wild boar loin for a longer period of time than the recipe specifies (about 8 hours as opposed to 1). For the onion mixture, I sliced them thinly and mixed them with vin de noix, red wine vinegar and salt. These were then baked with raisins in a clay cazuela until translucent. I am not sure what the end result is supposed to look like, but the onions never really softened up and caramelized. Instead they were more of pickled and a bit crisp and the whole mixture is sort if like an intense chutney. The marinated meat goes on top of the onion mixture and then back to the oven to roast until it reaches an internal temp of 145 F. I served the dish with potato cakes made with boiled mashed yukon gold potatoes, eggs, parsley and chives then pan fried till crispy. The meat turned out great, juicy and mild. 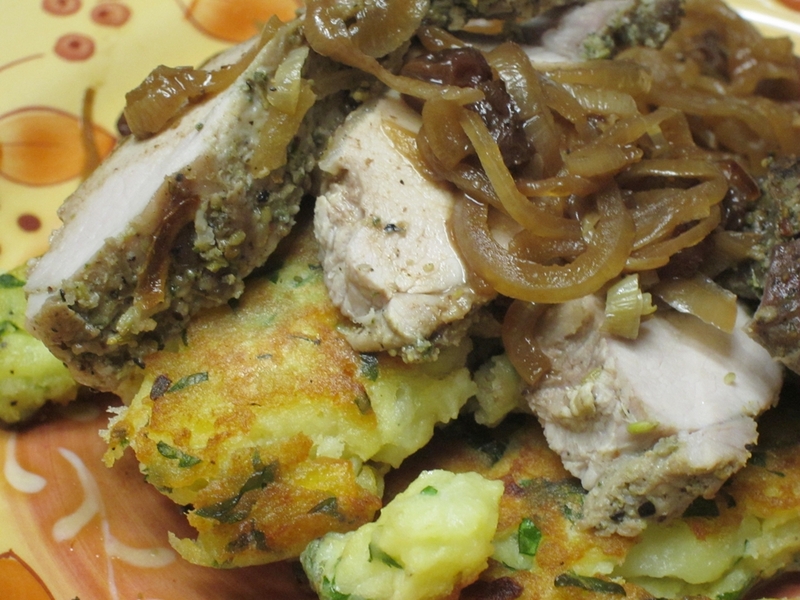 It was perfect with the tangy onion-raisin relish and the soft and crispy potato cakes.